2.1 Firefighters at Ground Zero (9/11) were told the air quality was safe. They now suffer an increased rate of cancer which is not covered because Congress had relied on a study that failed to make the link. Firefighters at Ground Zero (9/11) were told the air quality was safe. They now suffer an increased rate of cancer which is not covered because Congress had relied on a study that failed to make the link. 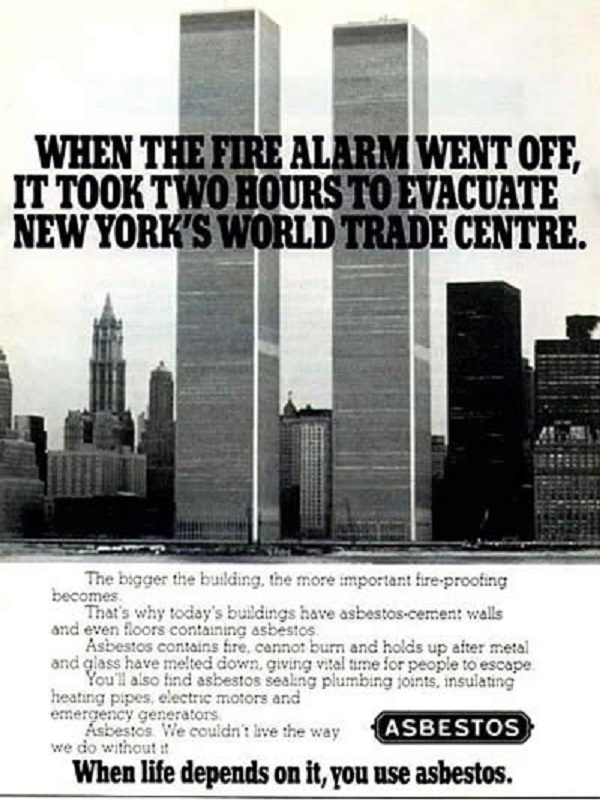 Those steel beams were all coated with asbestos. They knew those beams were coated with asbestos, but they said the air was safe anyway. They should all be in jail. Asbestos was in those buildings, lead was in those buildings... however the concentrations are such that they don't pose a health hazard... we're gonna make sure everybody's safe. Public health concerns about asbestos contamination are primarily related to long-term exposure. Short- term, low-level exposure of the type that might have been produced by the collapse of the World Trade Center buildings is unlikely to cause significant health effects. Thus far, from 50 air samples taken, the vast majority of results are either non-detectable or below established levels of concern for asbestos, lead and volatile organic compounds. The highest levels of asbestos have been detected within one-half block of ground zero, where rescuers have been provided with appropriate protective equipment. A friend of mine went to Vietnam (drafted) and he said when they were there they told them Agent Orange was fine, and afterwards they told them it was fine. Year later he received word "oh hey, don't donate blood, or organs, ever", and after he had a daughter he was told never to let her donate blood or become an organ donor, either. The Agent Orange Settlement Fund was created by the resolution of the Agent Orange Product Liability Litigation - a class action lawsuit brought by Vietnam Veterans and their families regarding injuries allegedly incurred as a result of the exposure of Vietnam Veterans to chemical herbicides used during the Vietnam war. The suit was brought against the major manufacturers of these herbicides. The class action case was settled out-of-court in 1984 for $180 million dollars, reportedly the largest settlement of its kind at that time. Gulf War Syndrome is really a catch-all referring to a number of ailments with no apparent cause other than serving in the Gulf during that period. It includes everything from fibromyalgia to chronic fatigue syndrome. The fires are likely a contributing factor, but not the only one. In the social sciences, unintended consequences (sometimes unanticipated consequences or unforeseen consequences) are outcomes that are not the ones foreseen and intended by a purposeful action. 40 minute mark in video, nutrition, sugar ok then bad, salt bad then ok, etc. This page was last edited on 12 March 2019, at 14:05.